We Protestants have not sufficiently appreciated the mother of Jesus and the important role she played in influencing the ministry of Jesus. Historically Protestants have reacted so sharply to many of the Catholic Church's beliefs about Mary, that we are a little shy to speak of her too much. But one does not have to accept Catholic Mariology to appreciate and affirm the significant role that Mary plays in the Gospels. Before we venture into John's Gospel, we need to dabble a little in the Gospel of Luke. Because Christians believe that Jesus was God incarnate, that is Jesus was God come to this earth in human flesh, it can be difficult for us to hold that claim together with the Christian affirmation that Jesus was also human. Luke tells us that as a boy and a young man, Jesus grew in wisdom and years (Luke 2:52). In other words, Jesus, even though he was fully divine, he was also fully human and, therefore, developed physically and intellectually. And there is little doubt that Jesus' mother played quite an influential role in his development as a human being. We must understand that Jesus' childhood years were not unlike that of any typical Jewish boy of the first century. His father taught him all the things that fathers taught their sons. Joseph taught Jesus how to work the land as well as the skills of a carpenter, or more accurately, a stone mason. Joseph taught Jesus respect for others, and he took his son to the synagogue for worship, prayer, and the study of the Scriptures. In the synagogue, Jesus learned and embraced in faith the story of the Bible. At home, Jesus learned more about his heritage and what it meant to be a Jew from his mother; for in Judaism it was the mother's responsibility to teach religion to her children in the home. At some point between Jesus' twelfth and thirtieth year of life, his father Joseph died; and as the oldest son, it was Jesus' responsibility to take care of his mother. While Mary knew her son's special place as God's Messiah, the Anointed One, she too, like the disciples, needed to learn what that meant. 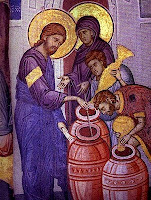 In John's Gospel, Jesus and his disciples are at a wedding in Cana in the northern province of Galilee. Jesus grew up in Galilee in the town of Nazareth. Either the bride or the groom may have been related to Jesus, but if nothing else they are friends of the family, for Jesus' mother is in attendance as well. In first century Judaism, wedding celebrations lasted for seven days. People would come and go for a week and there would be feasting and dancing and celebration. It was customary for the guests to bring a gift of wine with them to offer for the wedding. This would insure that wine was available the entire week. If the guests did not bring enough wine and the hosts ran out, it would be quite an embarrassment to the bride and groom. Often, near the end of each day, as the supply of drink began to run low, the wine was often watered down to make it stretch farther. These customs help put into perspective what is actually happening between Jesus and his mother in this story. When Mary approaches Jesus and informs him that they have run out of wine, we should not necessarily conclude from this that she is expecting him to do something miraculous. Jesus has just started his ministry and John tells us that it is at this wedding where Jesus performs his first miracle. Instead what she could be doing is gently chiding her son for not bringing his gift of wine. Indeed, if Jesus' disciples also did not bring wine, the lack of several gifts of wine could have led to quite an embarrassing situation for the family. So when Mary tells the servants to do whatever her son tells them, she may only be expecting Jesus and his buddies to go get their share of wine to bring back to the reception. But when one reads John's Gospel, one must keep in mind that the stories in John always have a deeper meaning; they must be read on a deeper level. It might indeed be that Mary is simply pointing out to her son that he didn't do what he was supposed to, but perhaps she also knows that as God's Anointed he has the capability to fix the problem in ways unknown to everyone else. That might indeed be the case given Jesus' response, "Woman, what concern is that to you, and to me? My hour has not yet come?" For Jesus to address his mother with the term "woman" is not a sign of disrespect. In first century Judaism, it was a common form of address. But notice Jesus' response. He seems to think that his mother is pushing him to do something that would reveal the nature of his calling as God's Anointed. We must remember that this is right at the beginning of Jesus' ministry. Perhaps his mother has come to believe that her son is dallying in commencing with his ministry and this is her attempt to push Jesus forward into fulfilling his Heavenly Father's call. How many times as a boy did his mother, like all mothers, tell her son to attend to something and he dutifully obeyed. Now at Cana it was no different. Mary tells her son to attend to the problem before them as a faithful son and he listens. But he does not instruct the servants on where to find wine, but instead he does exactly what will become characteristic of his ministry throughout-- he will accomplish the task before him with a miraculous deed. Let us thank God that Jesus had a mother who also knew what was best for him. Even the Messiah, the Savior of the World, had to acknowledge and honor the wisdom of his mother.